Hollywood, CA – Exhibit Records announces the release of a special Numbered Limited Edition album of the Johnny Cash 1964 classic, Orange Blossom Special. The 200 gram vinyl record has been remastered from the original master tapes and is handsomely presented in a sturdy old style gatefold jacket featuring the authentic album cover art, liner notes, historical recording session information and new archived photos of Johnny Cash taken in the Columbia Records Nashville studio during the recording session. The ‘Box Car Series’ is so called because the back of each album of this limited edition pressing contains a tiny replica of the actual Orange Blossom Special box car that partly appears on the album cover. Each box car has been strategically foil-stamped with a unique Limited Edition number. Orange Blossom Special finds Cash backed by the Tennessee Two, his outstanding guitar/bass tandem of Luther Perkins and Marshall Grant. And there are guest appearances by such distinguished Nashville names as tenor saxophonist Boots Randolph, pianists Floyd Cramer and Bill Pursell, guitarist Norman Blake, and harmonica ace Charlie McCoy. And June Carter joined Johnny on “It Ain’t Me Babe” for the first of many classic duet recordings they would make together over the years. 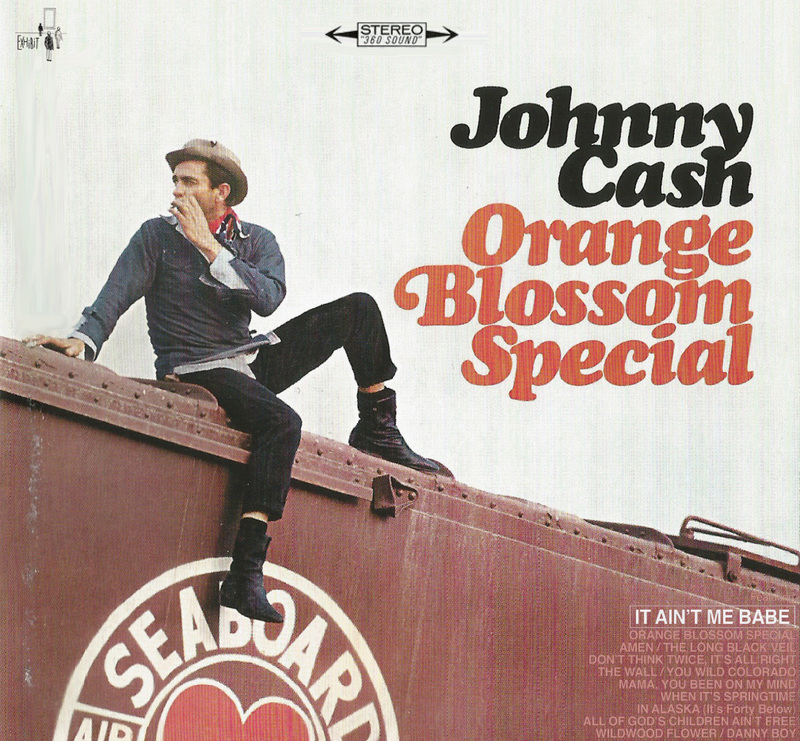 The Orange Blossom Special album by Johnny Cash is one more example of the fine music being produced by the budding Hollywood record company, Exhibit Records. The young music label has curated an eclectic catalog of classic recordings in a short time and continues to gain high praise and recognition for their exquisite mastering, high quality pressings and attention to details as displayed in the fine art and craftsmanship of their exceptional package design. This entry was posted on Saturday, July 11th, 2015 at 17:26	and posted in Johnny Cash, Press Release. You can follow any responses to this entry through the RSS 2.0 feed. « Jazz Guitar Icon Larry Coryell Shows His Multifaceted Talents On A New 3CD Box Of Live Recordings!